I just found this on Facebook from one of my friends and I think it is an amazing idea!! This is so simple and a great way to reuse citrus rinds instead of just throwing them out, you can also use the rinds as extra exfoliant in body butters, washes and scrubs! This is a simple and quick way to freshen up your home with ingredients you already have at home! No more having to go out and spend money on sprays, candles or other expensive fresheners. I cannot wait to try this! 1. Cut the fruit in half. 2. Cut out the fruit but leave the core center attached. 3. Pour oil in to the cored out fruit. 4. Add any other essential oils or even bits of the fruit in to the oil. 5. Light the stem and it will burn for hours. Back to school season is here and one of my favorite parts of school supplies was definitely book covers. I know many of us have fabric laying around that we hate to part with but have no use for. Now you do! I can’t believe I have never thought about doing this before! You can also totally personalize the covers when you are done and who knows this might make your kids want to crack open their text books! I found this fun project that is great for students or just DIY-ers like myself right here. There are plenty of photos to help you along the way if you get confused. Any bows, buttons, ribbons, odds and ends you have been needing something to do with to jazz up your book covers. 1. Iron the fabric you intend to use. 2. If the book has a jacket take it off and put it in a safe place. 3. When cutting the fabric make sure to leave about 1-2 inches of overhang all the way around the book. 4. Make sure to cover the surface you are working on with something you don’t mind getting sticky. Spray adhesive is an evil substance akin to Aquanet times infinity! 5. Spray the adhesive on the back book cover and spine. You don’t need too much as a little goes a long way and that stuff really is sticky. 6. Turn the book over, position it on the fabric how you want it, press down, turn it over so the back is now facing you, and smooth it out with your hand. 7. Do the same for the front cover. 9. Add some glue along the longer edge of fabric where it will meet up with the book. Do not go completely to the edges of the fabric. Fold over onto the inside cover to hid the edges. 10. Put a dab of glue where the fabric meets on the corner. Press the fabric together and hold for a few seconds. 11. Run some glue along the edge of the fabric and make sure to secure the fabric to the inside of the cover. 12. Fold the outer corners in a little bit and glue them into place. 13. For the spine cut the fabric to 1/2 inch to make sure enough is there to fold over. 14. Get a butter knife and use it to fold the piece of fabric into the spine. You can use a little dab of glue to secure the fabric if you want. 15. Once the cover is finished and set to dry for a little bit you are free to finish decorating the book anyway you want! Use your imagination and have fun with it!. Happy Earth Day Greenies!!!! It is the 43rd annual Earth Day and we should all be celebrating. Not with a party or making a mess but with intelligence. Today make sure you let everyone you come across know what day it is. Try to learn something new about how you can help our world be a better place. Everyone, including this Beagle right here can give you all of the tips and ideas on how to make your Earth Day/everyday greener and more Earth friendly but the only real answer to helping is education. Today to celebrate you should try to show someone who generally doesn’t know about or care about the holiday why it is so important. Even if you can convince them to make one tiny change in their life that is more than enough. Also make a point of educating yourself. Learn something new about being greener and try to implement that in your daily routine. All of the fun activities and books and green purchases are great but if you aren’t keeping yourself educated what is the point. It is easy to forget or be complacent especially when you see others not making an effort. Ideally we should consider everyday Earth Day but on days like today we should make a point of letting our green show! Make a point today of letting people know what day it is and share even the smallest tid bit of greenness with them. Sharing is caring!!! I was perusing one of my favorite online stores the other day looking for fun green things to present to my faithful readers and I found a few super cute, really interesting and just plain fun items that could work in almost any home. My major issue with ethical home products are that they are usually ridiculously expensive, look “reused” or have no thought behind it. In that they are bland and design/aesthetics didn’t really have a part in the development process. I understand that pricing for some products is necessary due to the process the items may have to go through to be made and usable. I still feel that an integral part of being ethical is obviously pricing. I feel like what is the point of making an item ethical when you have to spend an arm and a leg for it. I realize I have mentioned this before but to me a part of being ethical and conscious is being affordable otherwise it isn’t very useful for helping the masses. Here are a few super cute things I found at Uncommon Goods that I would enjoy owning myself. Product Description: Upcycled Zip Wallet’s raw materials once spent their days lounging around the beaches of Bali. That sounds lovely, except that those materials are actually plastic bags. Billions of plastic bags are used every year, and many of them find their way to the ocean, where they can be damaging or fatal to marine life. For each wallet, ten of those wayward bags are reclaimed from the shoreline, cleaned, cut and crafted into a durable cover. Inside are accordion dividers to keep your own resources organized, and an inner zippered pocket for your valuables. Because of the upcycled nature of the materials, each one will have a unique combination of bright colors. Because these wallets are handmade of recycled materials, each is one of a kind. Made in Bali, Indonesia. Product Description: The Two Tone Cork Apron is crafted from ultra-thin sheets of cork, a sustainably harvested material that is supple, durable, and naturally water resistant. Derived from the bark of Cork Oak trees, the material’s natural veining and stippled appearance gives a rich earthiness that is unexpected in a typically textile-based accessory. The dark-stained cork is set off nicely by the contrasting, lighter natural color of the ample central pocket, which is the perfect catchall for cooking utensils, towels or recipe cards. The apron is stitched around the edges and is reinforced with a cotton backing. Made in Portugal. It has been a while since I have posted in one of the most important sections of this entire blog! I am always on the look out for great stuff you can find that has been made right here in our little own country! It has been more difficult as the years go on to find anything that is made in the America and when you do the price is so much higher and let’s be honest not always of the best quality either. I am happy to see the pace of this Made in the USA trend pick up. That is the exact reason why I feel like it is important to search out what ever Made In The USA products and businesses I can find! I think these are super cute and love almost anything made from recycled flip flops. I know I get good use out of mine every summer. It is exciting to know that when I recycle them they do go to good use. Spring is right around the corner and I cannot wait to break out my flip flops, now especially after seeing these. The only thing I don’t necessarily love is the price however it is hand made and I can only imagine how long that takes so I can let it go. Product Description: Please allow 2-3 weeks for delivery. Bring the flip flop love into your home with these upcycled nesting boxes. Flip flop flotsam from flip flop factories (say that three times fast!) is wasted more than you might expect, but you can make a difference in the fate of such fun material by gracing your home with these nesting baskets. Each upcycled basket is comprised of patiently wired together pieces of flip flop, resulting in a colorful pattern. Use indoors or out, these boxes are fit for anything from toys to towels. I don’t know many people who are willing to part with their vinyl but I can say I have recently seen some of the most creative uses ever come out of recycling them. I think the jigsaw puzzle is an excellent way to upcycle them. You can still use and almost honor the record. This is a perfect gift for the hipster you know that you know. This 31-piece puzzle is lots of fun and a great conversation piece. Looking for a way to delight puzzle junkies or vinyl lovers? We gotcha covered. Made from Classic Rock LPs that celebrate the best of the 60s & 70s. Let us pick out a good one for you. Comes packaged in a sturdy, clear round box. I think this bowl is super cool. The design is very modern/minimalist but the coolest part is that 40-70% of the bowl is made from reclaimed stone! Besides the fact that it is hand molded which just sounds like a ton of fun to have that job! I know this is a little pricey for a bowl but hand made upcycled items are becoming more fashionable so sooner or later the price of conscious products will go down. Product Description: Molded by hand, this is one unique serving bowl! Comprised of an advanced concrete mix that has been fine tuned over years of experimentation, it contains anywhere from 40 to 70 percent of reclaimed stone dust obtained from tile and counter top manufacturers. A great conversation piece and an easy way to display in-season fruit or your favorite holiday bulbs! Because cement essentially cures continuously over time, these actually increase in durability over the years. Each hexi bowl develops a unique patina as it ages. Sealed to resist stains with carnauba wax. This I have to say is probably one of the simplest resolutions to recycling glass bottles that I really never thought about before. I would like to announce I would appreciate a little more decoration on the bud vases but over all this is a great idea! It is so simple and obvious I am ashamed I haven’t even thought of this before. I really, really love this idea! Product Description: Flower arrangements can be lovely, but why shell out fifty bucks when you can use this bud vase over and over again? These vases provide just as much of an impact on a room’s freshness with just four flower buds as an entire arrangement! Made of four upcycled glass bottle tops mounted on a glass pane, these glass vases are sealed to prevent leakage. Need a table centerpiece? These are the perfect size to hold taper candles- and the curved nature of the bottle easily catches any candle drippings! I talk about this all of the time! I am always looking for projects that involve around the house items that are educational. I have to say that the projects in The Best of Making Things sound like way more fun than most of the projects I have found. Every review I have seen so far for this book is top marks all the way around! This is very exciting for me to see. I can’t even lie I want to get the book just to test out the projects myself. I am particularly interested in the cardboard box loom!! You can find this amazing book and many others at Chelsea Green Publishing. 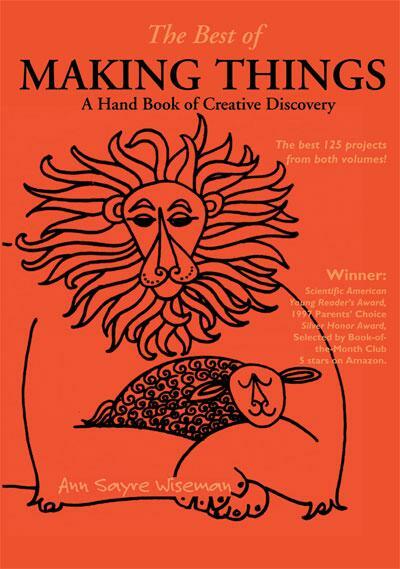 If you have read The Best of Making Things or tried any of the projects let me know! I would love to hear how they turned out. Description: Why go to the mall when you can make things at home using materials recycled from around the house? About the Author: Ann Sayre Wiseman developed this book while Program Director of the Boston Children’s Museum Visitor’s Center. A therapist, teacher, mother, and grandmother, Ms. Wiseman has written more than a dozen books. She is also an artist with work in the Rockefeller and Hirschorn collections, among others. By now I am sure we all have cabin fever from being snowed in for so long. How much digging can one do? Are you saying to yourself “if I see one more snowperson or fort of any kind I am going to lose it!!”? I was totally at that point today. So I turned to my trusty friend the internet. I found this idea from one of my friends who posted a photo of their very own snow-made snow ice cream on Instagram. What a great idea, right?!?! With all of this snow we might as well make good use out of it! The recipe is super simple and super quick to make. 3. Add the milk to your desired consistancy. ** You should serve immediately as snow does tend to melt quite quickly. You can put it in the freezer to save for later if you make enough. How adorable are these recycled glass earrings!?! I love the pattern in particular. Not that the pattern is anything very intricate but the simplicity is what makes me like them that much more. Recycled glass items in general have been interesting me more and more lately. I have been making some crafts of my own at home using recycled glass. 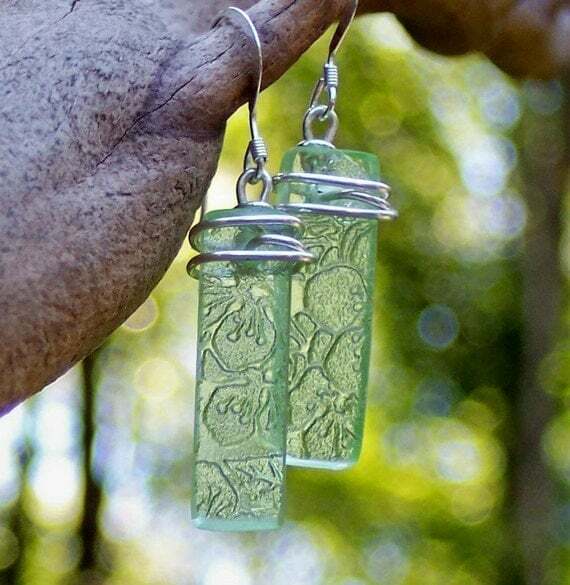 I don’t know why exactly recycled glass has been catching my eye so often but these earrings are completely my style and the fact that they are recycled glass is only an added bonus. If you don’t know what Depression Glass according to Wikipedia is clear or colored translucent glassware that was distributed free, or at low cost, in the United States and Canada around the time of the Great Depression. The Quaker Oats Company, and other food manufacturers and distributors, put a piece of glassware in boxes of food, as an incentive to purchase. Movie theaters and businesses would hand out a piece simply for coming in the door. Most of this glassware was made in the central and mid-west United States, where access to raw materials and power made manufacturing inexpensive in the first half of the twentieth century. More than twenty manufacturers made more than 100 patterns, and entire dinner sets were made in some patterns. Common colors are clear (crystal), pink, pale blue, green, and amber. Less common colors include yellow (canary), ultra marine, jadeite (opaque pale green), delphite (opaque pale blue), cobalt blue, red (ruby & royal ruby), black, amethyst, monax, and white (milk glass). Although of marginal quality, Depression glass has been highly collectible since the 1960s. Due to its popularity as a collectible, Depression glass is becoming more scarce on the open market. Rare pieces may sell for several hundred dollars. Some manufacturers continued to make popular patterns after World War II, or introduced similar patterns, which are also collectible. Popular and expensive patterns and pieces have been reproduced, and reproductions are still being made. You can get a pair of your own recycled glass earrings or any recycled jewelry at Novica.com. Because I love these earrings so much I have decided to give a pair away so you can enjoy them as much as I do. Click here to enter to win a pair of your very own Depression Glass Earrings. Good Luck and don’t forget to check out Novica.com for even more awesome items!! !